First of all, thank you Dennis Faas, for this great tool ! I'm actually testing a workflow, and I export lightmaps to adjust them (for a specific use) in photoshop (with scripts). Then I reimport them into SpriteDlight, to generate Normal map ! I don't know if it is easy/quick or not implement, since I'm not a developper. But I think it could be great to add the possibility to sprite Dlight to support scripting? Could it easily become like some others softwares supporting a simple but useful form of automation using XML-based scripting. This would allow you to load a picture, or lightmap, build and export normal map, modify basic settings all from the commandline, so we could batch process any import and export of maps. name of the script file as the parameter. something like "SpriteDLight.exe -import "C:/myLightmapModified.png" -export -Normalmap "C:/myFinalNORMALS.png"
Loads an image file (a png for example) from disk. We may specify either an absolute or relative file path. Loads an lightmap image file (a png for example) from disk. Saves an image file (a tga for example) to disk. and if I'm not clear don't hesitate to ask for more. or simply batch process lightmap to normal map? Thanks for this feature request. A command line functionality has been discussed since the stretch goal survey, however I decided not to pursue that concept, since the tool is heavily complex and dependent on the visual interface. I get that automatic processes are needed, and batch processing already does a great deal for that, however I also see that it is still not optimal for the integration into a pipeline. I have put your scripting request on my list of requested features and I will be looking into that. Apart from the lightmap to normal map batch conversion routine, what else do you think should a scripting system provide? In other words, how would it be different from the current batch processing feature, or do you think some additional options could be integrated into batch processing? How would you imagine the integration of lightmaps to normal maps into batch processing? Something like selecting a folder full of lightmaps and having the tool detect and combine the left, right, top and bottom lightmaps from the suffixes? Thank you Denis for this quick answer. and thank you for spending time into studying users suggestions. Too bad you chose not to pursue 'command line functionality' (which would increase the possibilities for spriteDlight to be much easily integrated into existing pipelines, but I understand there are existing priorities too). I think it would have been useful to be able to launch SpriteDlight through command line with a xml file as argument to specify values of scale, boost volume, shape intensity, volume etc... corresponding to a folder, and other values for another folder..
e.g. some props may need specific parameters whereas some characters may behave much better with different values..
-'batch EXPORTING lightmaps' from spriteDlight sprite (or normal map) in order to externally correct these lightmaps (by hand or batch)... (and further reimport them into spriteDlight to generate more accurate normal maps). I think adding a "Lightmaps Input Folder" line into the existing batch process window would still be a great feature and be useful ! (and yes, with maybe a word detection TOP BOTTOM LEFT RIGHT for mixing each '4 lightmaps collection' found inside a folder into a brand new sequence of normalmap). these features would be so great ! Let me know if I could help you in any way that I can. Sorry for the late reply and thank you for the great suggestions. I have been busy working on several features, like the batch processing feature. The next build will introduce recursive subfolder processing for the batch processing feature. And I have been looking into command line functionalities again, as it is something that many users would like to have for a better integration into their pipeline. Even though I found out that it is not impossible to implement this, it will take a lot of work (and time) to do it right, so I have put it on my list of more complex features that would be great to have (I might do another Kickstarter some time next year to probably be able to make some of these features a part of the software). But first of all, everything needs to run smooth and stable, so it can be released on Steam before working on extensions like command line functionality or even real shaders. I am still not sure if the lightmap batch importing and exporting option is really necessary. You were the first user to request it, and since the manual editing of the lightmaps is such a huge task to do, I doubt that there are many users who are looking to work with batches lightmap sets. An exporting option for the lightmaps in the batch processing dialog should not be a problem, I have also put this on my list. However the option to batch import them would mess up the batch processing dialog, since it would make things even more complicated. The lack of a sprite when batch importing light maps would lead to some of the other map types not being available for export (re-rendered sprite and partially specularity), which could be overcome by just hiding the respective checkboxes. If this is really a useful feature for a larger number of users, I would implement it as an exclusive choice of whether you want to process sprites OR lightmaps. 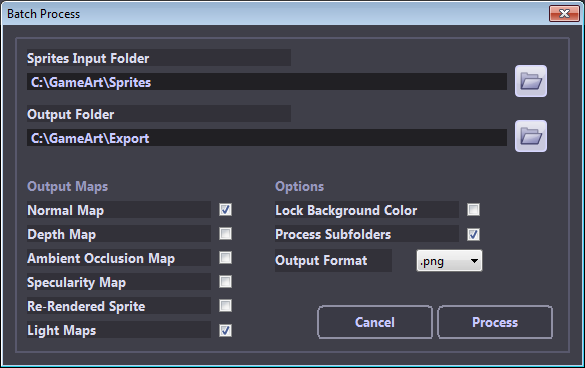 In your example picture, it would be a radio button where the current "sprite input folder" is, to choose either light maps or sprites as the input type, and a case sensitive "input folder" text field below, where your "light maps input folder" is. This would still be a potential source of errors. What if one or more lightmaps are missing in a set? Skip the files or cancel the whole processing? I know, these are small implementation problems that could be solved more or less elegant, so if I get this request more often, I will dig deeper into it! Update: Build 0.4 will feature an option to batch export light maps and to choose between png, bmp, tga and tif as the output format for all exported maps. Thanks again for your suggestion, PierreM!